Scandalous behavior by public officials is everyday news in the world today. But even in 18th Century Ridgefield, miscreants made their way into the local government. One prominent leader got himself—and the Town of Ridgefield—into a lot of trouble more than two centuries ago. 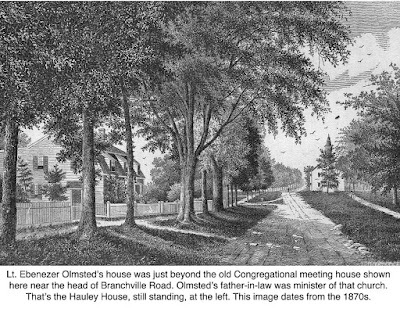 Born in Ridgefield in 1748, Olmsted was a well-connected as could be. He was a grandson of one of the founders of the town. He married Esther Ingersoll, daughter of the Rev. Jonathan Ingersoll, second minister of the First Congregational Church; her brother, Jonathan, was to become lieutenant governor of Connecticut (his son, Ralph, was elected a U.S. congressman). Olmsted had a house on Main Street, just south of the Meeting House, a prime piece of real estate. But he wound up under arrest, and lost all his possessions, including his home and even his desk. It all began on Dec. 21, 1780, when the Annual Town Meeting appointed Lt. Olmsted a constable and authorized him “to collect the state tax for the year ensuing.” The appointment was for one year, typical of tax collecting assignments, but it indicated he was held in high esteem — tax collectors had to be trusted people. Olmsted had apparently pocketed what he’d collected, quite possibly to pay for that Main Street spread he purchased two years after being named tax collector. He paid 300 pounds for the homestead, after selling his Wilton Road West place for only 75 pounds. Or perhaps it was the cost of supporting his family: He and Esther had 10 children. Why did it take five years to discover Olmsted had not turned in his tax collections? Possibly because the state was behind in its auditing due to the turmoil of the war that had been going on. In addition, the state was heavily in debt because of the war and was hungry for income. For the next six years, the town’s records are peppered with reports of how it was dealing with the crisis. And a crisis it was. First, the selectmen arrested Olmsted and confiscated his 13-acre homestead and all his possessions, including other land, eight tons of hay plus oats and flax, and “his desk.” They also took “2,258 Continental Dollars,” which were virtually worthless. His old commander, Col. Bradley, headed a committee to auction off the homestead, but that brought in only 120 pounds, far less than was owed to the town (although the amount owed is never stated). Col. Bradley was sent to Hartford, apparently to see if Ridgefield’s state tax debt could be forgiven, but the state was insistent. The war had been costly and it needed money. One result of the Olmsted fiasco was that the Annual Town Meeting in 1790 voted that henceforth, a performance bond — a former of insurance — would be purchased to cover tax collectors. To this day, the town requires — and provides — a bond on the tax collector to assure that if a shortfall occurs because of misdeeds, the town is protected. Olmsted apparently left town in disgrace. He died in 1801 in New Haven at the age of 53. His wife lived 46 more years, dying in St. Louis, Mo., in 1847 at the age of 87.